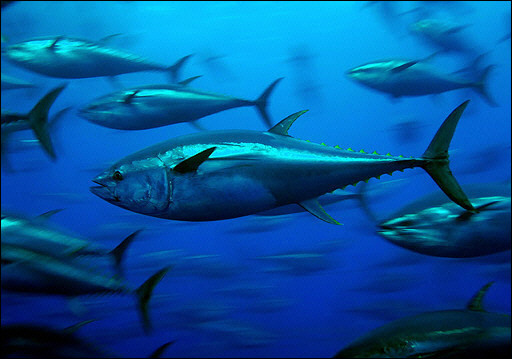 ICCAT, the International Commission for the Conservation of Atlantic Tuna, recently convened in Morocco for its annual evaluation of catch limits. This is a group that for many years seemed to be turning a deaf ear to the calls of conservationists and even its own scientific advisers as to the diminishing bluefin tuna population (read prior posts here & here). Year after year, catch limits were set way above any recommended number that could potentially provide sustainability. This year, the ICCAT awoke slightly from its deep, dark slumber and established catch levels that were in line with limits prescribed by marine scientists: maintaining the current level of 13,500 tons annually, along with an improved management and control process. It still leaves the Atlantic bluefin tuna on a razor's edge with extinction a distinct possibility. A complete moratorium would be the most sensible environmental solution but the economic influence of the tuna fishing industry makes that a slim possibility - although it could occur if continued observation and management shows that tuna stocks are not improving. That was the wake up call this time around: that after 30 years of setting catch levels that were considered sufficient, the ICCAT realized that was just not the case. Now the big concern is whether this new effort will be sufficient to give the bluefin tuna a fighting chance. The ICCAT also establishes quotas for its member nations with regard to sharks. This year there was a proposal from the EU to limit catches of shortfin mako and a complete ban on the porbeagle shark. The poor porbeagle. This is a shark that has truly been hammered by the shark fishing industry. Authorities do not question the fact that the population of porbeagle sharks has declined by 90% since the 1960s. Where once there were ten, there is now only one - and it only took five decades to do it. Unfortunately, the EU's proposals were tabled due to some political maneuvering by a few dissenting members. To accommodate some of the dissenters, like Canada, there were rumored discussions about allowing Canada an exemption. With that, other dissenting members demanded equal treatment which was sufficient to knock the wind out of the sails of the entire proposed platform. Often when we think of the overfishing of tuna or sharks, many turn to Asian markets as the primary villains. While it may be true that that is where most of the demand is coming from, we must also consider the nations that support that demand. At the ICCAT meeting this year, Canada turned out to be a disappointing supporter; one of the pushers supplying the junkie's habit. The Canadian contingent had actually requested an increase to 2,000 tons in the bluefin tuna catch limit, but they were soundly defeated by the majority. However, they doubled their efforts when it came to resisting the shark limits, even though the Canadian government is considering listing the porbeagle shark as an endangered species under its Species at Risk Act. “I think it is fair to say that there was a general feeling across the meeting that [Canada’s tuna proposal] was out of step, that there was very clear scientific advice that said maintain the quotas,” said Amanda Nickson, director of the U.S.-based Pew Environmental Group’s global tuna conservation program. Basic supply and demand principles work fine for manufactured or grown products. It can be a seesaw of price vs. demand and demand vs. production, but it works most of the time. Where it does not work is when you have a finite resource like tuna or sharks. Demanding consumers and the producers that blindly support that demand with product, both are responsible parties to what could be the collapse of an industry and, sadly, the extinction of important ocean species. Scientists and conservationists must be relentless in their efforts to halt overfishing of the bluefin tuna, shortfin makos, porbeagle sharks, and many others.